These are the settings we used to calibrate the Samsung 55" Q8C (QN55Q8C) TV, and we expect our settings to be valid for the 65" version (QN65Q8C), and 75" version (QN75Q8C). These settings are good for any content, from watching movies to TV shows and gaming. For Gaming, some minor adjustments need to be done, and they are listed below. The first thing we did was to turn off all of the 'Eco Solution' options from the 'General' tab in the settings menu. 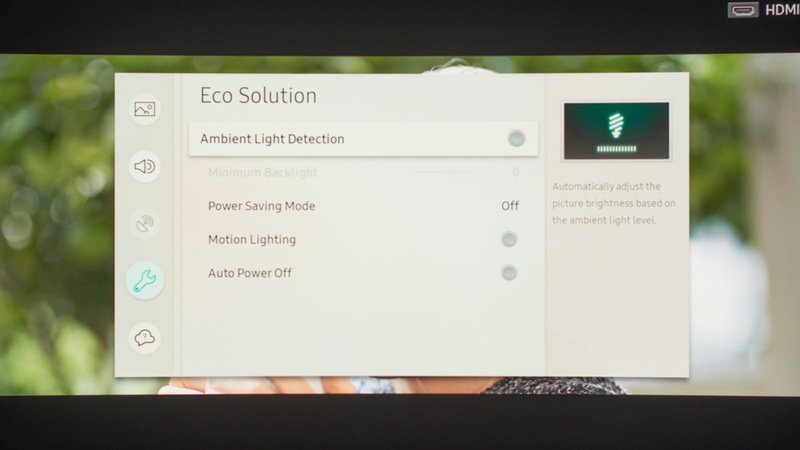 When turned off, the TV luminance won't change automatically depending on your room brightness. 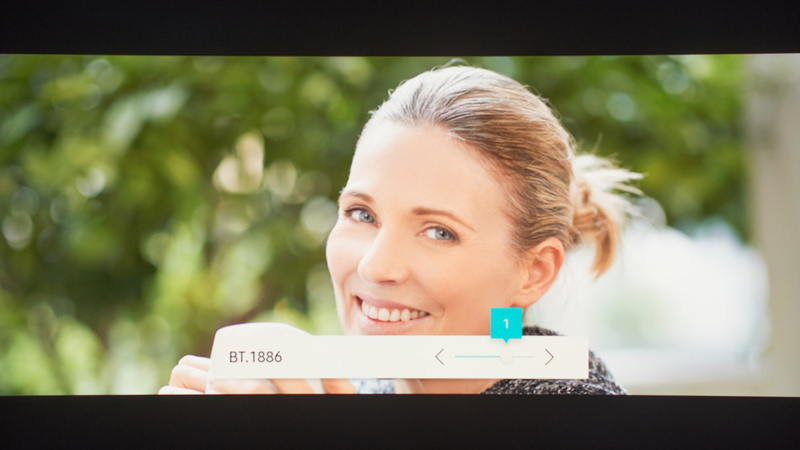 For movies and TV content, we selected the 'Movie' 'Picture Mode', since it is the picture mode that gave us the closest result to our calibration goal and it should bring the image quality closest to what the content creator intended it be. We set the 'Picture Size' to '16:9 Standard' with the 'Fit to Screen' option set to 'On'. The 'Fit to Screen' option permits you to fit and match the input signal without having to manually adjust the display scaling from the source output setting. It can also be useful to fully fill the screen when watching some lower resolution content. For our totally dark room and to have a luminosity closest to our calibration target of 100 cd/m² we set the 'Backlight' to 5. 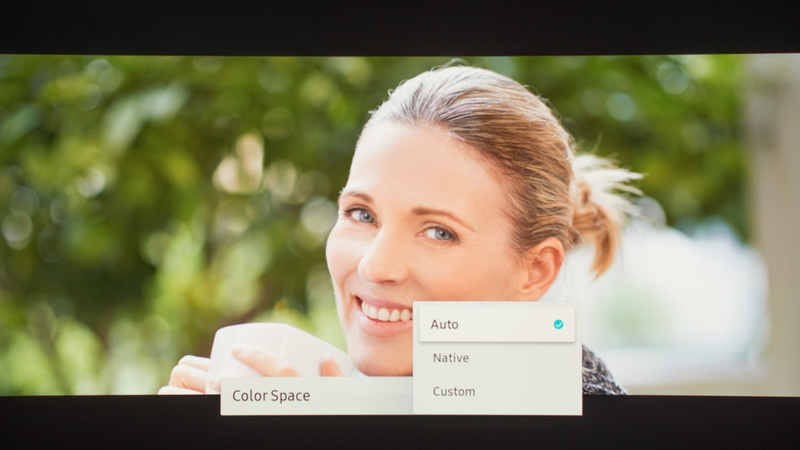 Note that you should change 'Backlight' to match your room lighting and it won't affect the picture quality in any way. We left the 'Brightness' to 0, the 'Contrast' to 95, their default values. We set the 'Sharpness' to 0 to avoid any oversharpening and we left untouched the 'Tint (G/R)' to its default value of 'G50 and R50'. We left unticked the 'Digital Clean View', but if you are watching some older low-resolution content, you may want to set it on to make the content smoother. For the calibration and review purposes, we left the 'Auto Motion Plus Settings' Off (more on the 'Auto Motions Plus Settings' in the next paragraph). We set the 'Local Dimming' to 'Low' for the calibration (usually, we turn it off for the calibration, but that was impossible for this TV), but for normal use, we recommend you to set it to 'High'. If you find that the TV brightness changes too much by itself depending on the on-screen content, you can try the 'Normal' or 'Low' setting. 'Contrast Enhancer' was left turned off since we don't want to add any extra image processing so we could see movies or any other content as it was intended. 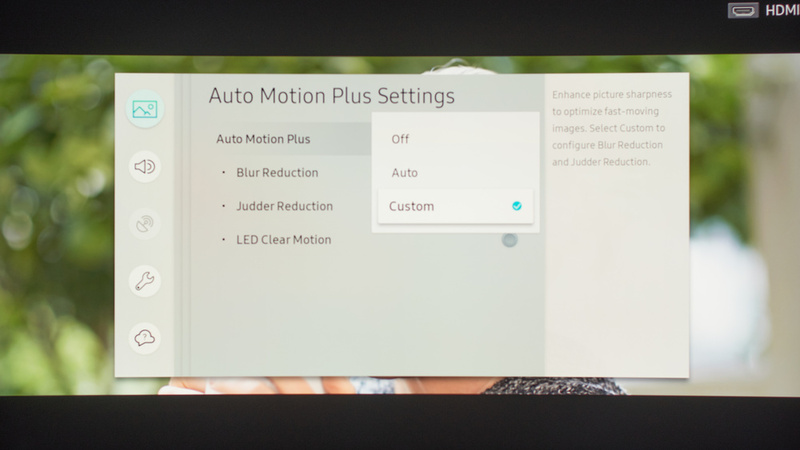 The 'Auto Motion Plus Settings' is controlling the motion interpolation (also name soap opera effect. If you like the Soap Opera Effect, set 'Auto Motion Plus Settings' to 'custom' and then adjust the 'Blur Reduction' and the 'Judder Reduction' slider to add the amount of soap opera effect desired. You can read more about the motion interpolation feature of the Q8C here. The 'LED Clear Motion' control the black frame insertion feature and if you want to know more about this feature you can read here on the review page. We selected the 'Warm2' 'Color Tone' since it was the closest to our calibration goal, but you can change it to a cooler 'Color Tone' if you find the color too yellowish or red. We adjusted the 'BT.1886' gamma to +1, to reach our desired goal of a 2.2 gamma during our calibration. It is important to note here, that the 'Gamma' type will change by itself (you can't change it) to match the content that is playing on the TV. For standard SDR content, the 'BT.1886', for HDR the 'ST.2084' and 'HLG' for Hybrid Log-Gamma. 'RGB Only Mode' is left untouched, since we don't need this function. 'Color Space Setting' was set to 'Custom' to do the calibration of the color space, but you should leave it to 'Auto' if you don't intend to calibrate the color space. 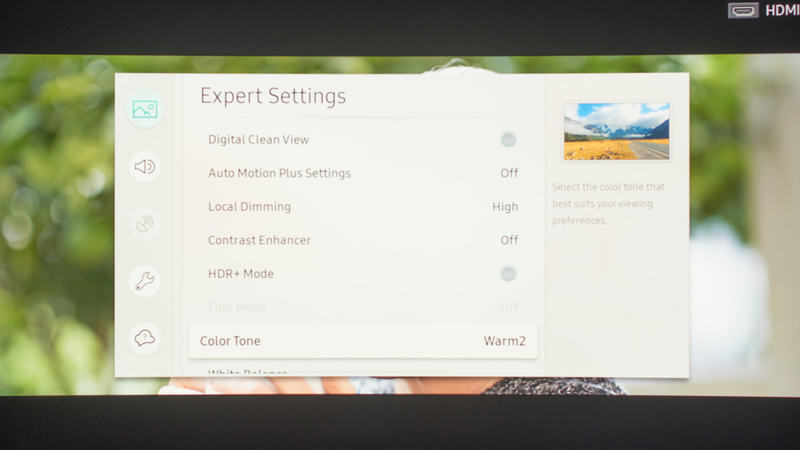 For watching HDR content via an HDMI input it is important to set the 'HDMI UHD Color' on for each HDMI input that will receive the HDR content. This will allow the HDMI port to transmit the bandwidth necessary for HDR. If the 'HDMI UHD Color' is not turned on, some devices might not recognize the Q8C as being HDR compatible. For HDR content, it is also preferable to set the 'Backlight' to the max, set 'Local Dimming' to 'High' and set the 'Color Space Settings' to 'Auto' or 'Native', since HDR does not use the same color space as SDR content. For playing games via a video game console or PC you can keep the general settings previously mentioned and you need to turn on 'Game Mode' from the 'External Device Manager' to have the lowest possible input lag. For HDR gaming whether you are using the XBOX One S, the PS4 or PS4 Pro or a PC, apply the same HDMI settings mentioned in the HDR settings and game settings above. Note that while the TV is in game mode, if it detects HDR content, it will change to the right gamma settings, change to the right color space (when it is set to 'Auto'), but the 'Backlight' and 'Local dimming' won't change. 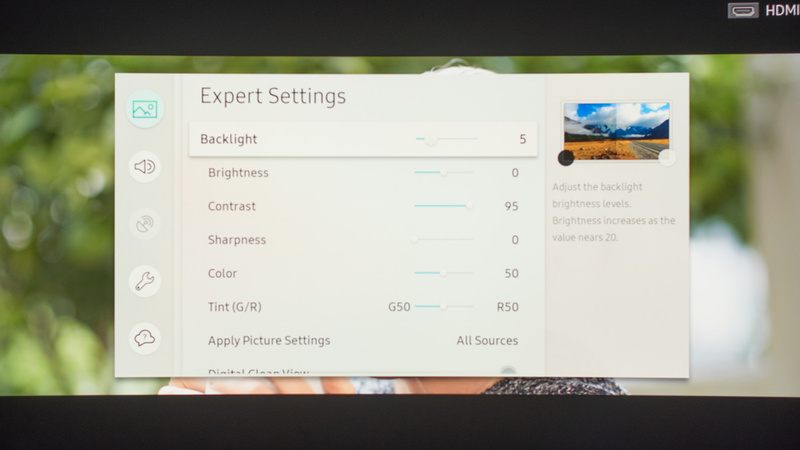 To have the best HDR experience, just change the 'Backlight' to the max and the 'Local Dimming' to 'High. If you are using your Q8C as a PC monitor and you want to enable the chroma subsampling (4:4:4), then set the input icon to 'PC' from the input menu if you want the TV to support chroma subsampling. To remove judder from 24p movies without adding the soap opera effect, and this doesn't matter if the movies are playing from 24p sources like DVDs or Blu-rays or 60p/60i source like cable TV, the 'Auto Motion Plus' setting need to be set at 'Custom' and both the 'Blur Reduction' and 'Judder Reduction' sliders need to be set at 0. If set more than 0, the TV will introduction some soap opera effect to a certain level, depending on how much the sliders are moved.